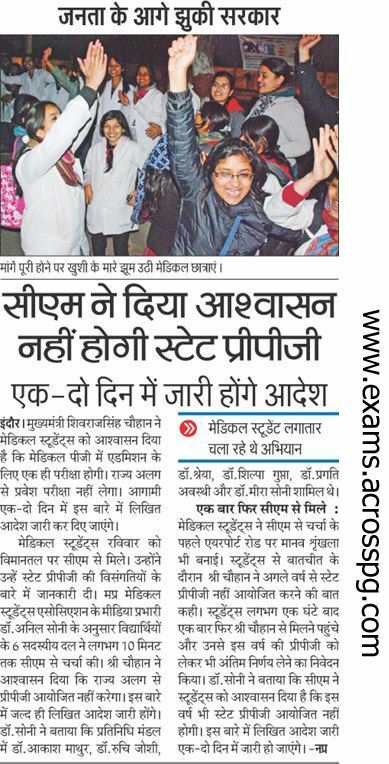 Hardwork of MP Medicos finally paid, CM says no MP Pre PG this year - AcrossPG Exams! As soon as MP Govt declared separate pre PG entrance to fill up PG seats for MP students, all the medicos gathered together to fight against separate entrance exam. Medicos wanted that the seats of MP stated to be filled from the NEET PG merit. Finally the hard work of medicos of MP showed positive results and the CM of MP finally agrred to scrap MP Pre PG this year. In his statement he said, "Keh dijiye sabhi chaatron se ki mamaji ne ghoshna ki hai NAHIN hogi iss saal MP Pre PG"....!!!! :)"
The official notification yet to come.